The U.S. Treasury Department announced a new round of sanctions against Russian individuals and entities on Friday, including seven wealthy oligarchs, 12 of their companies, a state-owned weapons trading company called Rosoboroneksport, that company’s RFC Bank subsidiary, and 17 government officials. 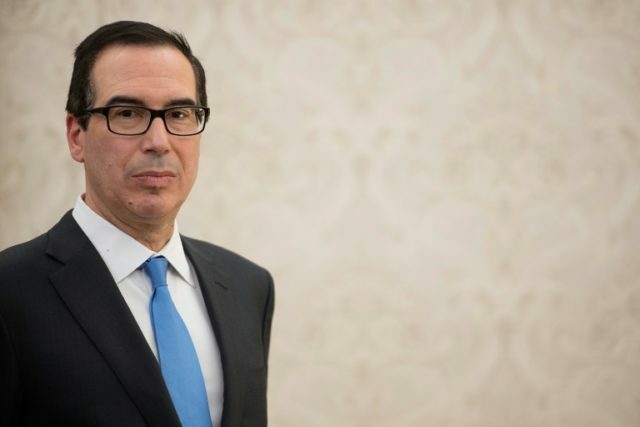 “The Russian government operates for the disproportionate benefit of oligarchs and government elites,” Treasury Secretary Steven Mnuchin said in a statement announcing the new sanctions. “The Russian government engages in a range of malign activity around the globe, including continuing to occupy Crimea and instigate violence in eastern Ukraine, supplying the Assad regime with material and weaponry as they bomb their own civilians, attempting to subvert Western democracies, and malicious cyber activities,” Mnuchin continued. “Russian oligarchs and elites who profit from this corrupt system will no longer be insulated from the consequences of their government’s destabilizing activities,” he declared. The new sanctions package freezes all assets subject to U.S. jurisdiction held by the designated individuals and entities, prohibits Americans from doing business with them, and could potentially trigger sanctions against non-U.S. persons who facilitate transactions by the sanctioned entities. The sanctioned oligarchs include Oleg Deripaska, who presents himself as a representative of the Russian state when traveling abroad and is accused of offenses ranging from money laundering to extortion, racketeering, bribery, ties to organized crime, and ordering the murder of business rivals. Deripaska is also linked to the Steele Dossier, the suspect document that helped to launch controversial surveillance of President Donald Trump’s 2016 campaign, and to Trump’s former campaign chairman Paul Manafort. Another sanctioned oligarch is Suleiman Kerimov, who is a member of the Russian Federation Council accused of evading European tax laws by lugging around huge amounts of cash in suitcases and laundering money through shady land deals. Kerimov was arrested in France for tax evasion last November. Among other holdings, he controls Polyus, which is Russia’s largest producer of gold. One of the more provocative sanctions targets is Kirill Shamalov, who became fabulously wealthy after marrying Russian President Vladimir Putin’s daughter in 2013. The couple reportedly broke up in January 2018 – it is hard to tell the exact status of any Putin family relationship because the Russian press is forbidden from reporting on them – and Shamalov’s fortunes sank immediately as the value of his political connections crashed, but he remains fabulously wealthy. The twelve firms designated for sanctions are all owned or controlled by the sanctioned oligarchs, many of them tied to Russia’s energy sector. Russian government officials listed in the Treasury statement include Andrey Akimov, chairman of the management board for Gazprombank, technically a subsidiary of the gigantic Gazprom national energy company but actually controlled by the Kremlin. Gazprombank, the third-largest bank in Russia, was reprimanded by Swiss financial regulators in February and banned for taking new private clients in February due to “serious shortcomings in anti-money-laundering processes” revealed by the Panama Papers. A good deal of the suspicious Gazprombank activity detailed in those leaked legal documents from Panama involved Putin’s lifelong friend Sergei Roldugin. Most of the officials designated for sanctions on Friday were listed because they hold top positions in the Russian Federation, but Treasury noted that one of them, Alexey Dyumin, was also formerly the head of Special Operations Forces, which “played a key role in Russia’s purported annexation of Crimea.” Another individual targeted for sanctions on Friday, Alexey Miller, is the CEO of Gazprom. The Treasury Department cited weapons trader Rosoboroneksport’s “longstanding and ongoing ties to the Government of Syria, with billions of dollars’ worth of weapons sales over more than a decade.” Human Rights Watch accused Rosoboroneksport of “cashing in” on atrocities in Syria, callously unconcerned that their weapons have been used by Syrian forces to unlawfully murder civilians.